"Dance is such a joyful act, one that connects body, mind, and spirit. In dancing with and for others we enjoy a human connection deeper than our everyday experiences. Bellydance has allowed me to become part of a community that values the strength, creativity, and indefinable beauty of all women. Performing and teaching is my way of giving back and honoring the fulfillment I found in Bellydance." Nancy has been dancing for almost 2 decades at a variety of venues, in a variety of dance forms. She has training in Modern; Ballet; Tribal, ATS & Cabaret Bellydance; Persian Classical; African; Jazz; American Folk & Colonial; Tunisian; Egyptian; and Turkish dance. Working as a bellydance instructor for over 10 years, she has honed her skills to emphasize sharp, clean movements and uncomplicated musical interpretation. Nancy is available for performances as a solo artist, or she can bring a group of dancers. She teaches regular classes through MindBody Studio and Lynchburg Parks & Recreation and is available for private instruction. Lead Dancer; Lynchburg Tribal 2002-Present. Bellydance ensemble. Nancy is responsible for the majority of choreography and dancer training. Lynchburg Tribal performs throughout Central Virginia on a regular basis for weddings, parties, restaurants, television, haflas, and festivals. Dancer; Nizhmet Bellydance Troupe 2008-9. 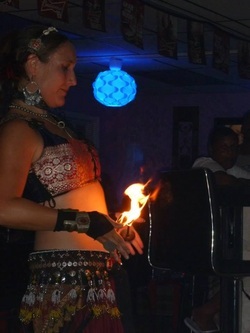 Fire & Fusion Bellydance troupe. Performances included live music, fire dancing and spinning, celtic & latin fusion bellydance. Nancy created group choreographies, danced with fire fans and palm torches, and consulted on dancer solos. Nizhmet performed throughout Central Virginia and at festivals such as the Garlic Festival, Richmond Highland Games, and FloydFest. Dancer; Fire in the Belly 2001. Tribal Bellydance troupe. Nancy was a student member during a transitional period for the troupe. Performed at weddings, art installations, and cultural festivals. Dancer; KTMA Performing Arts Ensemble 1997-2002. Numerous public and televised performances throughout Central Virginia.